7 way relay box for micro relays with 4 or 5 terminals. 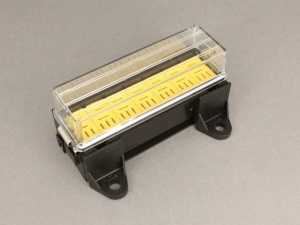 Includes clip-on clear protective cover (with gasket), bottom cover and terminal locking cages. Fixing holes are located on the four removable feet along the sides of the box. 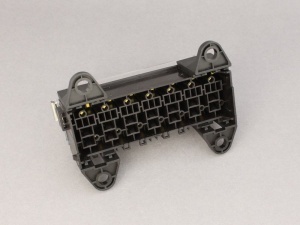 Supplied with 4.8mm and 6.3mm female blade crimp terminals to suit cable size 1.0 - 2.5mm². These are crimped to the cable, inserted into place from the base of the relay box and then locked into place from above using the yellow terminal locking cages. 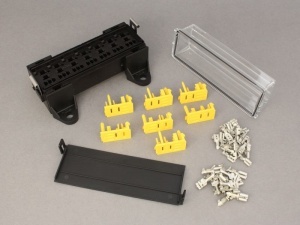 These relay boxes can be clipped together to increase capacity to 14, 21 ways etc. and can also be clipped to 16 way fuse box P00602 and to 4-way standard relay box P00710 to form a combined relay & fuse box unit. Sold individually (relays not included - please order separately).